The Post Office offers a full philatelic service for collectors, with regular issues of interesting and attractive stamps. The world's remotest Post Office team welcomes you. Discover our available stamps and place an order today. 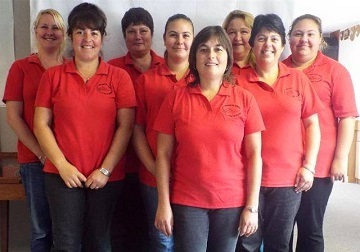 The Team (left to right): Kelly Green, Shirley Squibb, Lillie Swain, Janine Lavarello, Dawn Repetto (Head of Tourism and Heritage), Tina Glass, Iris Green (Head of Post Office Department), and Caryn Green. Iris, Lillie, Kelly and Caryn will receive, pack and dispatch your orders of stunning Tristan stamps and other Post Office products. Dawn deals with enquiries for Handicrafts and Souvenirs. 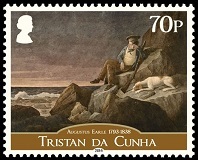 Tristan da Cunha did not have stamps until 1952, and the first ones were overprinted St Helena definitives. Essays priced in potatoes were however prepared in the 1940s as part of the petition for stamps. Before then, islanders had to rely on the good will of visiting ships. 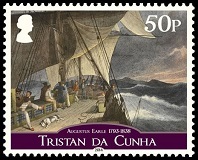 Tristan stamps have been popular with collectors ever since. See our Stamp Archive page for more. Tristan stamp production is being handled on behalf of the Tristan da Cunha Post Office and Philatelic Bureau by Creative Direction (Worldwide) Ltd., while all stamp marketing is being handled by Pobjoy Mint Ltd.
All parties involved in this arrangement are dedicated to ensuring that Tristan stamps are produced to the highest quality and that they appeal to our existing loyal collector base whilst also reaching a wide international market.